Well, no interest in Yori. So maybe you will have some interest in Tron, Tron:Legacy, and Tron:Uprising as Bruce Boxleitner comments on all, including Tron 3. Here is an interview with Bruce at the 3D Creative Arts Awards, February 1st, 2012. 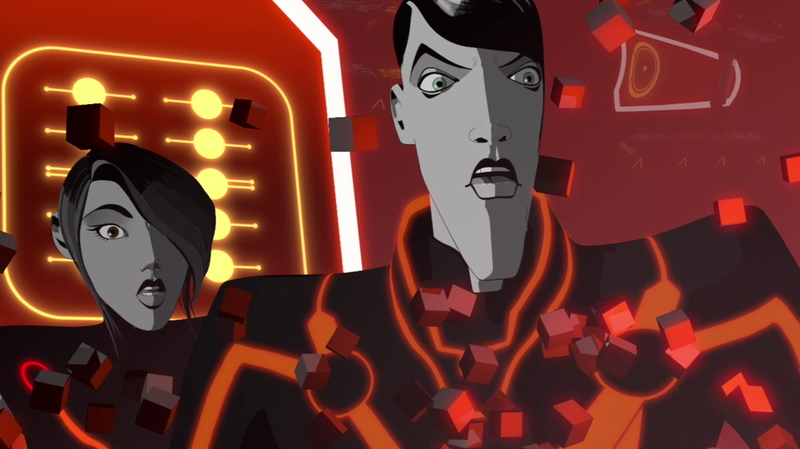 More Bruce, more Tron:Uprising, and more Tron 3, at the 39th Annual Annie Awards. Excellent interviews!! It's great to see his enthusiasm for the upcoming TV show, as well as for Tron3. These are great clips, Spark! ... thanks for posting them! On the other side of the screen it all looks so easy. I got my brother into Tron * evil laugh * oops. Was I supposed to at like an adult. * thinks a moment * Nah. Anyways, thanks for the clips. I'm exited. FlynnOne Wrote:These are great clips, Spark! ... thanks for posting them! Um, Spark didn't post them. Cool83 did. Cool!! I think there will be merchandise and he just cant say so yet. Huh? I didn't post anything. I think you mean to praise cool83, not me. cool83 Wrote:By the way, Bruce Boxleitner is on twitter(@boxleitnerbruce). Have you chimed in yet? I saw ShadowSpark there. I asked if he had any info. On toys or merchandise for Tron:Uprising. He tweeted back "No, Sorry". Can you believe it, Bruce Boxleitner tweeted ME. I'm never gonna wash my thumbs. Yeah, I'm there. He /does/ respond to tweets. I'm never deleting the email notifications of that. I mean, I actually had a conversation with him! It's so amazing that he takes time for his fans like this. I think its because your sig picture looks like Cool83's a bit. trekking95 Wrote:Cool!! I think there will be merchandise and he just cant say so yet. Yes, you are right. I was just hoping for more info.. I really want a NERF Identity Disk so we can all play on a racket ball court. That would be COOL. *walks in, stumbling under a large pile of compliments* I've got a huge heap of praises here for a 'cool83'. My deluxe disks work well in melee battles against the Force FX lightsabers, but I agree that NERF disks would be safer to play with. I've often thought of a three piece NERF disc. It would consist of three parts, a heavy plastic inner ring and two durable foam disc parts. The inner ring would have to allow for proper deflection, which would allow the transfer of energy needed to "Bounce" back. The game would consist of two players on a racket ball court taking turns at hitting each other. A legal strike can only be made by deflecting your disc off of two walls. Players are allowed to move UNTIL the opponent's disc is released. Attacks are made in turn, not at the same time. If there is no hit, movement may continue. The player who launched the failed attack must reclaim their failed disc, but must follow the rule of disc release, and stop if the opponent disc is thrown. This may seem impossible, but given the difficulty in hitting your opponent, this would make for a very fast paced and exhausting game. The player with most hits wins. After a hit, players are allowed to reset, with the scoring player having the first throw. Now all we need is a proper NERF Identity disc. ShadowSpark Wrote:My deluxe disks work well in melee battles against the Force FX lightsabers, but I agree that NERF disks would be safer to play with. So you actually "fight" with you disc against people with FX lightsabers? cool83 Wrote:I've often thought of a three piece NERF disc. It would consist of three parts, a heavy plastic inner ring and two durable foam disc parts. The inner ring would have to allow for proper deflection, which would allow the transfer of energy needed to "Bounce" back. The game would consist of two players on a racket ball court taking turns at hitting each other. A legal strike can only be made by deflecting your disc off of two walls. Players are allowed to move UNTIL the opponent's disc is released. Attacks are made in turn, not at the same time. If there is no hit, movement may continue. The player who launched the failed attack must reclaim their failed disc, but must follow the rule of disc release, and stop if the opponent disc is thrown. This may seem impossible, but given the difficulty in hitting your opponent, this would make for a very fast paced and exhausting game. The player with most hits wins. After a hit, players are allowed to reset, with the scoring player having the first throw. So like the foam outer ring, a plastic ring in the center and a foam ring in the center of that? No, the disc is in two pieces, as if cut in half, like slicing bread. The heavy plastic ring(or other more suitable material)would sandwich between the two disc halves, fitting in the grooves in both ring halves. it's just a dream really, but I would pay $75.00 for a competition Identity disc.